30/6/2014 Finally a standard wall dimmer available for DALI fittings!!!!!! 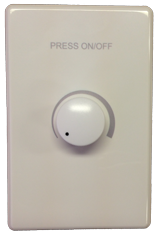 Smartscape Automation in conjunction with AXA Design have today released their new DALI P20 dimmer. Made to look and feel like a standard wall dimmer, the DALI P20 is an all in one solution, just mount it in a standard wall cut-out, connect 240 volt directly to it and wire to your DALI fittings and you’re all set to go! No external power supplies, interfaces or programming required! Although the unit can operate straight out of the box, advanced features can easily be accessed and set, including switch on level, or sensor integration options. For more information see the data sheet and installation guide below and please contact us if you have any questions.